“There was an outside main deck and an upper-deck on which the steerage were allowed. These were each about 40 feet wide by 50 feet long, but probably half of this space was occupied by machinery, ventilators, and other apparatus. There was no canvas to keep out the rain, sun, and continual showers of cinders from the smokestack. These fell so thick and fast that two young sailor boys were kept busy sweeping them off the decks. “It is impossible to remain in one’s berth all the time, and as there were no smoking and sitting rooms , we spent most of the day on these decks. No benches or chairs were provided, so we sat wherever we could find a place on the machinery, exposed to the sun, fog, rain, and cinders. These not only filled our hair, but also flew into our eyes, often causing considerable pain. “These same two outdoor decks were used also by the crew during their leisure. When asked what right they had there, they answered: ‘As much as the passengers’ No notices hung anywhere about to refute this. The manner in which the sailors, stewards, firemen, and others mingled with the women passengers was thoroughly revolting. Their language and the topics of their conversation were vile. Their comments about the women, and made in their presence, were coarse. What was far worse and of continual occurrence was their handling the women and girls. Some of the crew were always on deck, and took all manner of liberties with the women, in broad daylight as well as after dark. 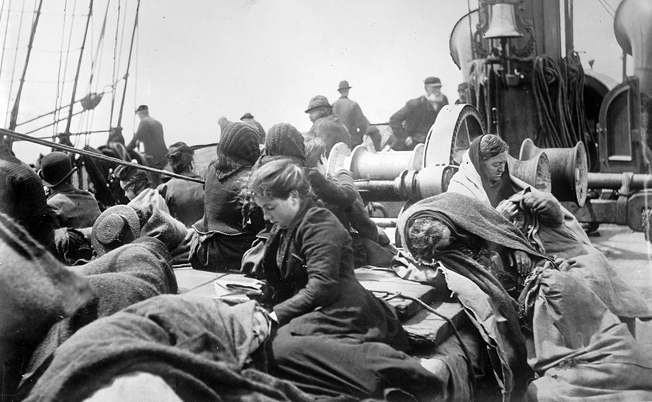 “Not one young woman in the steerage escaped attack. The writer herself was no exception. A hard, unexpected blow in the offender’ face in the presence of a large crowd of men, an evident acquaintance with the stewardess, doctor, and other officers, general experience, and manner were all required to ward off further attacks. Some few of the women, perhaps, did not find these attentions so disagreeable; some resisted them for a time, then weakened; some fought with all their physical strength, which naturally was powerless against a man’s. Others were continually fleeing to escape. Two more refined and very determined Polish girls fought the men with pins and teeth but even they weakened under this continued warfa.re and needed some moral support about the ninth day. The atmosphere was one of general lawlessness and total ‘disrespect for women. It naturally demoralized the women themselves after a time. There was no one to whom they might appeal. 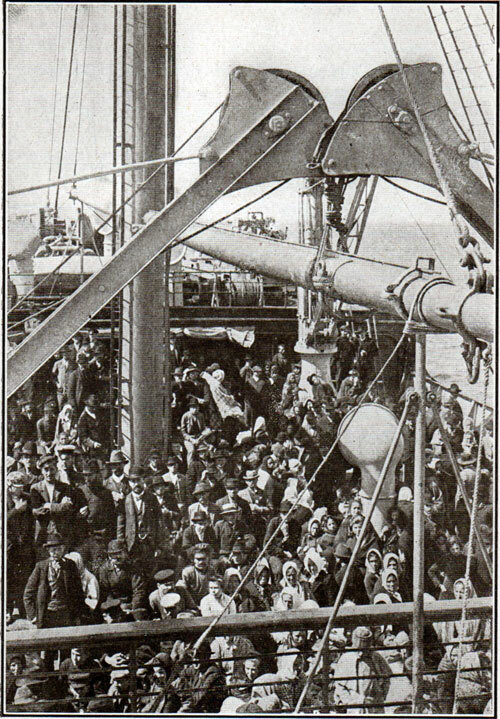 Besides, most of them did not know the official language on the steamer, nor were they experienced enough to know they were entitled to protection.